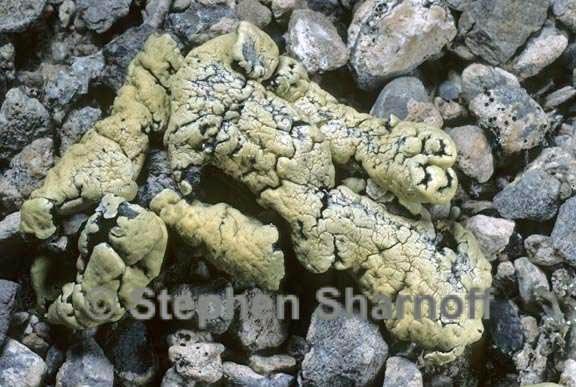 Thallus: mostly 0.5-1.5 (-2.5) cm across, polyphyllous and often appearing squamulose or pulvinate, or rarely monophyllous and then usually deeply lobed lobes: distinct to indistinct, usually to 0.5-5 (-10) mm long and 0.5-1.5 mm across, ± coarsely crenate-incised, ultimate segments: usually c. 0.5 mm across; thin and plane to concave, to sometimes thick and/or convex towards thallus center, sometimes plicate, edges: plane or down-turned upper surface: dull to shiny, occasionally ± pruinose, usually light to moderate greenish yellow, in herbarium turning more yellowish or slightly brownish or grayish, edges: concolorous or blackening, smooth and shiny to roughened (occasionally forming black thallospores) lower surface: blue-black near edges, usually continuous, smooth to uneven or roughened; umbilicus: often rather broad and indistinct Apothecia: 0.4-1.7 mm diam., immersed then sessile, or soon basally constricted to substipitate; disc: concave to plane or undulate, rarely convex, yellowish brown to moderate brown, olive, or greenish to bluish black, epruinose (especially when black) or weakly to densely pruinose, then appearing light yellowish brown to greenish yellow or bluish gray; thalline margin: variable in width, ± concolorous with thallus or paler, entire to flexuous or crenate, weakly to strongly raised and inflexed, persistently so or finally level; hymenium: ± hyaline, usually not inspersed, but the uppermost part often covered with granules; paraphyses tips: often becoming capitate and greenish brown to bluish black ascospores: ± ellipsoid to subglobose but rather variable in size and shape, c. 8-13 x 4-7.5 µm Pycnidia: often common Spot tests: upper cortex: K- or rarely + yellowish, C-, KC+ yellow, P-, UV-; medulla: K-, C- or occasionally C+ red, KC- or occasionally KC+ red, P- or P+ yellow, UV- Secondary metabolites: upper cortex: with usnic acid only; medulla: with no substances or various fatty acids (pertusaric/ constipatic acid complex), or with psoromic and/or occasionally lecanoric acid chemosyndromes and occasionally other unidentified substances. Substrate and ecology: on rock, usually calcium-low (e.g., basalt, granite, schist), but sometimes on calcium-rich sandstone or even on limestone; usually on ± exposed and often somewhat nutrient-enriched surfaces, from pinyon-juniper communities up to the spruce zone and into the low alpine World distribution: circumbipolar, circumboreal, circumaustral except for Australasia; extending to the tropics in alpine areas; Europe, Asia, northwestern and eastern Africa, North and South America, Antarctica Sonoran distribution: Arizona, southern California, and Baja California from 1100-3000 m. Notes: As treated here, R. melanophthalma s. lato can usually be recognized especially by the combination of: thallus ± squamulose to less often distinctly umbilicate, with at least some concave to flattened parts and distinct bluish black tinges on the margins or the underside towards edges (in contrast to R. subdiscrepans); upper surface usually relatively deeply yellowish green to olive or brownish; hymenium ± colorless below (never orange); absence of cortical substances other than usnic acid (all in contrast to R. chrysoleuca and R. subdiscrepans); and absence of terpenoids in the medulla (in contrast to R. peltata). For distinctions between R melanophthalma and lobate species of Lecanora (e.g., L. weberi Ryan), see the treatment of those taxa.